In this article, we will talk about the existing live football betting strategies and the specifics of using them in practice. While both tactics have a right to existence, I prefer the passive mode. I believe that, in case of an unfortunate scenario, this mode leaves bettors more options to improve the situation. For example, if you bet on no goal scored, and the goal is scored, you can always change the strategy in the course of the game and live bet on a different outcome. Obviously, you cannot do the same when using the reverse tactic, as you will have to wait through the game for the goal to be scored. Further below, we will look at other strategies based on changes in the course of a game. Another characteristic of live bets is that in live betting, unlike in pre-match betting, bookmakers tend to radically change their odds when a goal is scored, especially at the beginning of a game. This mostly refers to betting on total and handicap. If you have made a pre-match analysis and know how the game is going, you have a short period of time when you can make a good bet. This method is used when betting on a favorite, and we will come to that later. The confidence in the favorite’s win even if they have had a bad start. Besides, you make judgments about a possible outcome by just watching the live match. The odds for a favorite are always low before the match, while in case of a favorite’s bad start, they rise significantly, making the bet attractive. There is a strategy of betting with low odds based on the same principles. The idea is the following: if, before the match, the bookmakers’ odds for the favorite’s win are about 1.2, and they tend to go down, then, if the leader loses, you should wait and, as soon as the odds increase, make a handicap bet of -1.5 on the favorite. The strategy is similar to Value Betting which some consider to be a foolproof one. According to statistics, when teams tend to play off the field center, attacking each other and quickly delivering the ball into the opponents’ penalty area, the matches turn out to be scoring ones. Mind, however, that this only applies to matches where both teams play to win. Sometimes, you can see from the game, that both parties are satisfied with the current score and do not want to risk. Statistics show that the situation is typical for teams placed at the bottom of the tournament table where every point counts. In this case, betting on total may be risky. Here we do not mean sure bets in their classical form. What we do is practically make sure bets ourselves. The idea of the strategy is to make two bets — one before the game and the other — in the process (a live bet). Now let us look at an example of this system. We bet on the draw in the first half before the match. The odds here are typically more than 2.0. Bet Two. We make a live bet on a goal in the first half, 5-10 minutes after the match begins, when the odds increase to the extent sufficient to form a sure bet. Read more about sure bets. The table does not contain one more possible outcome — a quick goal before Bet Two is made. In this case, bettors can either wait for the score to even hoping that the half will end with a draw, or, judging by how the game is going, choose some other market for the bet. 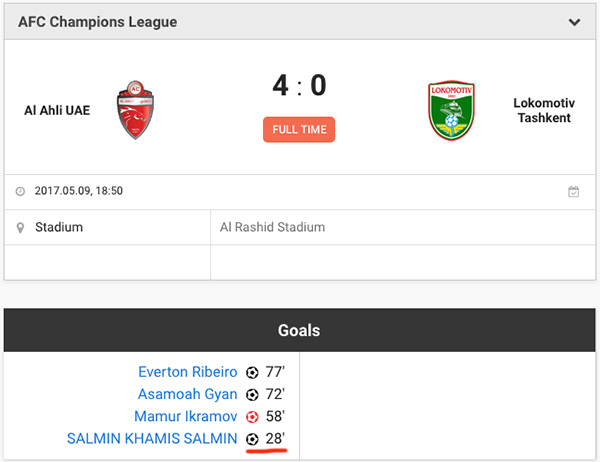 The AFC Champions League. Group stage. Bet One. $100 on the draw in the first half. The odds — 2.19. When, at the end of the 22nd minute, the odds for the total over (0.5) have reached 2.13, we make Bet Two of $100. That done, the further course of the game is of no importance to us. Let us note, however, that the first goal in the match was scored 4 minutes after the sure bet was “closed”. Choose a match between equally strong teams — this will reduce the probability of a quick goal. If a sure bet has already formed, do not wait too long to place the second bet hoping for better odds to come along. It is also a good idea to calculate what odds you need in advance. This strategy is similar to the previous one. Before the match, we bet “on 12”, that is, against the draw. Once a goal is scored at the beginning of the game, the odds for the draw will rise dramatically. If there is a sure bet, we make the second bet — on the draw. As we can see, before the match, there are good odds against the draw — 1.42. Typically, for teams that do not have obvious advantages over each other, the odds for this market vary between 1.3 and 1.4. If we use the online calculator available at the link above, we will find that a sure bet (bringing minimal profit) will appear when the odds rise to 3.6. If a bettor aims at the ROI of 4%-5%, with the total sure bet amount of $200, and the odds of 3.9-4.0, then the amount of the first bet with odds 1.42 should be 150 dollars. The goal was a long-awaited one (scored at the 77th minute), but already at the 78th minute the odds for the draw have reached 4.15, which is a bit higher than could be expected. Losing no time, we bet 50 dollars on the draw. 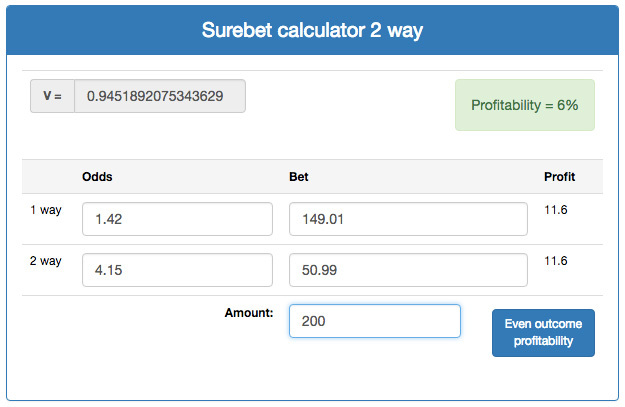 Our bet amounts and profit are close to the ideal ones that we previously calculated. It is believed that there are two key moments in football live betting. The first is the 30th minute of the first half. By this moment, you may have already grasped the tendencies of the game and can bet accordingly. This is the moment when it is recommended to bet on match total over (1.5) if no goals have been scored yet. The second “control point” is the 70th minute. The outcome is near and, judging by the course of the game, you can… take advantage of bookmakers’ faulty handicaps and odds. Also, the 70th minute is the best moment for betting on one more goal to be scored in the match. Live betting in football offers bettors a large scope for experiments. Through trial and error, one can develop various winning strategies. In my opinion, the greatest advantage of live betting is the opportunity to make a bet based on the live course of the game. Experienced bettors can benefit immensely from being able to bet live — no pre-match analysis can give you the same insights in the game. Among other factors that make this betting segment attractive, I would include a large number of markets, quick change of odds, and the opportunities for sure bets. At the same time, the risks are higher, too, so live betting is more suitable for experienced players. All Football Betting Strategies Gathered Together — Which of Them Are Foolproof?